John Pearce has been a long-time member and supporter of the Brisbane Lions. A director of Collection House Ltd, Pearce was the Brisbane Lions’ No.1 Ticket Holder through its Premiership years, retiring in 2008 after seven years in the position. Pearce founded and chaired the Brisbane Lions Foundation, was awarded Life Membership of the Club, and is still a member of the “Lethal Lions”, formed in 2002 as an exclusive membership group within the Club. Originally from Rutherglen in Victoria, Pearce quickly became a part of the Coorparoo football club when he moved to Queensland in the 1970s, and has been a major contributor to AFL in Queensland since then – AFLQ honouring him by naming the scoreboard after Pearce at the Yeronga headquarters. Pearce has also been a key contributor to a number of sports in Queensland, and is an avid follower of the state’s cricket side, the Queensland Bulls. 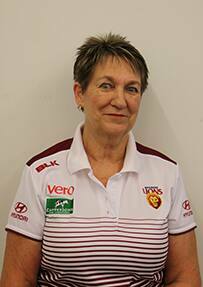 Marie began her time at the Lions part-time in membership in 1994 before becoming the full-time Administration Manager in 2004. She has worked in finance, membership and even had a short stint in corporate sales. She also acted as a ‘house-mum’ in the early 2000s, taking in Des Headland, Richard Hadley and Ash McGrath while they found their feet in Brisbane. Marie’s fondest memory is the 2001 Grand Final. It was the same week Ansett Australia collapsed. Ten buses were chartered to Melbourne for members and the cheer squad and Marie was in charge of five of those buses. They left on Thursday morning and arrived in Melbourne just in time for the parade on Friday. Marie lists Luke Power as her all-time favourite Brisbane player and names young-gun Lewis Taylor as her favourite player in the current squad. She is confident that success is just around the corner for the young group of Lions. “Stick with the team because I think they’re building towards something special,” she said. Lenard Poulter is one of Queensland’s most successful businessmen – and a long-time supporter of the Brisbane Lions. 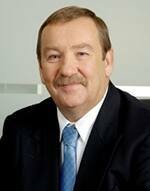 He is the founding director of Lenards Chicken and has over 40 years of experience in retail. 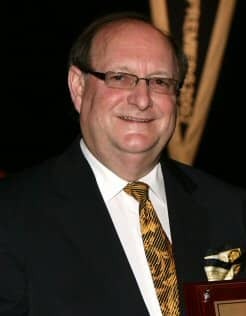 Poulter was inducted into the Franchise Council of Australia Hall of Fame in 2003 and was Director of the Brisbane Lions Board between 2010-2012. Poulter is one of the original members of the “Lethal Lions” (2002), a group that has provided generous financial backing to the Club. Brisbane born and bred, Chris Lynn is the captain of the Brisbane Heat in the Big Bash League and batsman for the Queensland Bulls. Lynn's blistering form with the bat over the 2015/2016 summer saw him crowned the Big Bash League player of the tournament. Lynn plundered 378 runs for the Brisbane Heat during BBL|05. His strike rate a whopping 173.39 runs per 100 balls faced, for an average of 54 – an incredible number in the shortest format of the game. The 25-year-old was announced the Brisbane Lions’ Ambassador in March 2016. While AFL wasn’t his first sport of choice, the friendships Lynn has forged recently with some of the Lions’ playing list, including captain Tom Rockliff and brothers Dayne and Claye Beams, had motivated his switch to AFL and his support for the Lions. Lynn is currently playing for the Jamaica Tallawahs in the Caribbean Premier League. 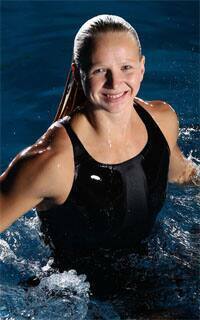 Melanie Wright is one of Australia’s top freestyle swimmers. She represented Australia at both the 2008 Beijing and 2012 London Olympic Games, taking home medals on both occasions. In 2008 she won gold with the 4x 200m Freestyle team and took home a silver medal as a member of the 4x 100m Freestyle relay team. A glandular fever-like illness looked set to derail Melanie’s career and briefly forced her into retirement in 2009. But ten months into her retirement Melanie was back in the pool and by the end of 2011 was back competing internationally. In 2012 Melanie was a star of the Australian women’s swimming team at the London Olympics, winning gold as the anchor of the 4x 100m Freestyle relay team. She then went on to win two silver medals as a member of the 4x100m Medley relay and 4x 200m Freestlye relay teams. 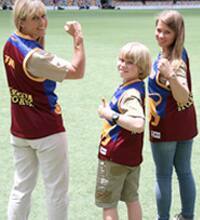 Born on the Sunshine Coast, Melanie grew up supporting the Brisbane Bears and then the Lions. She is a long–term Lions Member, an avid AFL fan and has been a proud Official Ambassador of the Brisbane Lions in recent years, using her extensive social media following to “spread the word” about her beloved team. Melanie is also a Foundation Member of the Women Of The Pride. 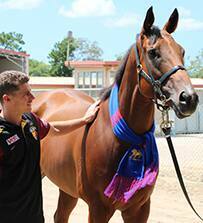 ‘Seven-million dollar’ horse and multiple group 1 winner, ‘Buffering’ and owner Robbie Heathcote will begin their third season as Brisbane Lions ambassadors in 2016. 8-year-old, Buffering ran a career-best 56.34 seconds for the straight 1,000 metres to take out this year’s Al Quoz Sprint on World Cup night in Dubai in March to surpass career earnings of more than 7 million dollars. Buffering will next to go to Hong Kong for the Chairman's Sprint Prize on May 1 and Heathcote said he was now considering a trip to Royal Ascot for the King's Stand Stakes. The Irwin Family are undoubtedly one of Queensland’s greatest natural assets. Terri, Bindi and Robert are high-profile campaigners for the environment and protectors of wildlife across the World. Based at the multi award-winning Australia Zoo on the Sunshine Coast – a 40 hectare haven for thousands of animals visited by hundreds of thousands of people every year – the Irwin family are passionate about spreading the word on animal protection. Terri and late husband Steve’s wildlife documentaries have brought Australia Zoo to the world stage and have attracted visitors from across the world to the Sunshine Coast. Steve and Terri filmed over 300 episodes of The Crocodile Hunter, Croc Diaries, Croc Files, New Breed Vets, Ghosts of War and Bindi: The Jungle Girl, and starring in the blockbuster movie The Crocodile Hunter: Collision Course. These programs are now seen in 142 countries by 500 million viewers worldwide. In 2006, Terri was awarded an Honorary Member in the General Division of the Order of Australia for her ‘outstanding dedication to wildlife conservation and the tourism industry’. She was also the winner of the 2006 Ernst & Young Northern Region Social Entrepreneur of the Year and 2007 Queensland Telstra Business Women’s Award. In 2014, Terri was a Queensland nominee for the prestigious Australian of the Year Awards, and also won the InStyle Australia Women of Style Environmental Award, recognising her for her outstanding work in wildlife conservation. Bindi is an international award-winning celebrity who has inherited her father's passion for wildlife and conservation. By the age of 9, Bindi had appeared on numerous American chat-shows, including The Ellen DeGeneres Show, The Late Show with David Letterman, Oprah and Larry King Live. In 2007, Bindi launched her very own TV show, Bindi: The Jungle Girl, which won an Emmy in 2008 and was nominated for an Emmy again in 2009. In 2008, Bindi won a Logie for 'Most popular new female talent' and in 2009 she was nominated for an ARIA (Australian Record Industry Award). Bindi has co-created a range of books called Bindi Wildlife Adventures which have been launched in Australia, New Zealand in 2010 and the US in 2011. 2013 marked a huge year for Bindi, with the additional launch of two new television shows, Bindi's Bootcamp and Steve Irwin's Wildlife Warriors - the latter of which she starred alongside Terri and brother Robert, with the series nominated for a 2013 TV Week Logie Award. Bindi was also nominated for a Logie for Most Popular Female Television Presenter that same year. In November 2013, Bindi, Terri and Robert earned the greatest reward ever when the Steve Irwin Wildlife Reserve - a special conservation property dedicated to Steve - was declared safe from mining by the Queensland State Government. The Irwin family had campaigned for seven years to save the reserve, and could not be more thrilled. In 2014, Bindi was awarded the prestigious Australian Geographic Society’s Young Conservationist of the Year, an honour that she dedicated to her dad. Robert, born in 2003, is a chip off the old block, and with his cheeky grin and natural curiosity, he loves nothing more than catching lizards and skinks, learning about wildlife and the Australian bush, and hanging out with his much-adored sister, Bindi. Like his mum and sister, Robert has also been quite the jetsetter and travelled all over the world attending events like the Emmys and the Nickelodeon Kids Choice Awards. 2014 and 2015 marked another significant milestone for Robert. He co-hosted his very own first TV series called Wild But True, airing on the Discovery Kids Channel throughout South East Asia and the Discovery Kids Channel on Foxtel in Australia. Following on in his dad’s footsteps, the TV series about bio-mimicry allows Robert to share his passion for wildlife and conservation with the world. In 2015, Bindi traded work boots for heels when she was crowned the winner of America’s ‘Dancing With The Stars’.